George Romero maybe best known for his zombie films, but during the interim years between his classic "Night of the Living Dead" and "Dawn of the Dead" he directed a number of wildly different movies. Three of which, "There's Always Vanilla", "Season of the Witch" and "The Crazies" have been brought togethor for the first time in an extras laden Blu-Ray and DVD box-set, which is out now from Arrow films. One of Romero's few non-horror movies, "There's Always Vanilla" is essentially a drama about a young man, Chris (Raymond Laine) who returns to his home town of Pittsburgh, where he quickly becomes enamoured with an aspiring model/actress named Judith (played by Night of the Living Dead's Judith Streiner) and subsequently develops a relationship with her. Told in flashback form, with Chris narrating in between scenes, this is really more of an art-house film as we see the relationship initially flourish and then start break down and him going through the troubles of finding employment, dealing with the prospect that the child of one of his ex partner's might be his and dealing with his estranged parents. Presented in its original 4:3 (full screen) aspect ratio, which has been digitally restored from a 2k scan of the original camera negatives. This is something of an oddity in Romero's catalogue, which he himself admitted was his least favourite film. Unless you like arty films, this will probably only appeal as a curiousity piece to fans of his horrors, with this previously being hard to get hold of . Extras wise, the disc contains the following special features. Affair of the Heat : Making of documentary (30 mins) A brand new documentary about the making of the film featuring interviews with Judith Streiner and film makers John Russo and Russel Streiner and others. Digging up the Dead feature (16 mins). An archive interview with George Romero filmed back in 2005, carried over from the previous Anchor Bay DVD, in which he discusses "There's Always Vanilla" and "Season of the Witch"
Lastly, there's the film's theatrical trailer. Not to be confused with that god-awful Nicholas Cage film from 2011, "Season of the Witch" revolves around a bored, middle aged housewife (Jan White) who befriends a new woman in the neighbourhood, which she later discovers dabbles in witchcraft. With her husband frequently away on buisiness and few friends, she becomes interested in her new friends hobbies and decides to have a dabble in magic herself and the film follows her as she uses her spells to seduce her daughter's on-off boyfriend and get her husband to stop knocking her around and, well, that's about it really. Apart from some weird nightmare shes having (which seem totally superfluous to the plot) and something going wrong at the end (I won't spoil it for you though). Originally titled "Jacks Wife", with a run time of 130mins, the film was re-edited and retitled several times, before being released in a 90min version as "Season of the Witch". Anchor Bay released a 120min version in 2004, having unearthed a slightly longer print of the film, though the original elements to the 130min version are long thought lost. As with the previous film, this one is also presented in 4:3 (Full screen). I was sent the DVD to review which contains the 90min theatrical version on with the alternate/extended scenes for the 120min version included as extras. However, according to the press release the Blu-Ray allows you the option of watching these as part of the film. The treatrical version was taken from a 4K scan of the original camera negatives, the alternate/extended scenes appear to have been taken from a theatrical print, so there is a notable dip in quality in these scenes. When Romero met Toro (55mins) - Fellow director Guillermo Del Toro chats with George Romero about his films and moviemaking in general. Alternate opening titles - 3x different intros to the film, bearing the titles "Jack's Wife", "Hungry Wives" and "Season of the Witch". Trailers - 2x trailers are included, one with the alternate title "Hungry Wives", the other "Season of the Witch". Undoubtedly Romero's best known film outside of his Living Dead movies, "The Crazies", takes place in a quiet rural town in Philadelphia, where the locals are alarmed to discover the military in Hazmat suits, cordoning off the town and placing it under quarantine. It turns out a crashed military plane has contaminated the local water supply with an experimental nerve toxin. As the first signs of madness begin to show amongst the townsfolk and the military struggle to contain the situation, a group of friends who work for the local fire service, decide to head into the woods and hide on the outskirts. But with the military hot on their trail, this proves no easy task and despite the army's best efforts to contain the town and find a cure, the situation continues to deteriorate. So even if they escape, will they have anything to come back to? A tense thriller, which pre-dates the similarly themed "Cassandra Crossing" and "Outbreak" by several years, and enjoyed a big budget remake in 2010, this is definitely one of Romero's best films, which has been restored using a 4K scan of the original negatives and has never looked better. Romero Was Here : Locating the crazies feature (12:23) - a guided tour of the various locations of Evans City PA used in the film by Romero Historian Lawrence DeVincentz. Lynn Lowrey Q&A (35:49) - Audience Q&A session with the actress filmed at teh Abertoir film festival in the UK. Lee Hessel Audio Interview (4:31) - Interview conducted with Producer Lee Hessel, recorded in 2014. Behind the Scenes footage (6:25) - Rare unseen behind the scenes footage, recorded on 8mm film, which you can watch with either the films soundtrack playing in the background, or with commentary by Romero Historian Lawrence DeVincentz. Alternate opening titles - Alternate intro for the film displaying the title "Codename Trixie"
Trailers and TV spots - A selection of trailers for the film are included. A great selection of extras BUT I was very dissapointed to discover that this release did not contain the Audio commentary track with George Romero, included on the previous Anchor Bay/Blue Underground releases, and instead opts for a new track with film journalist Travis Crawford. Would have been nice to have included this track as well, especially given Romero's passing earlier this year. Also, the interview with Lynn Lowrey on here is an entirely new one, and not the same one from the old Anchor Bay/Blue Underground discs. 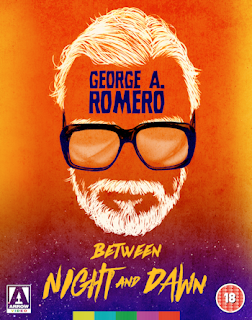 To summarise, Between Night and Dawn is a excellent collectors set for those intrigued by Romero's lesser known films. Though lack of Romero audio track on The Crazies disc is a dissapointment (completists will also note that MARTIN is conspicuous by its absense here), but is still a must for fans and collectors of Romero's works. 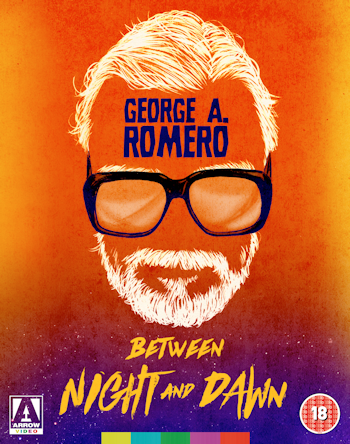 The "Between Night and Dawn" BD/DVD Box-Set is available in the UK now from Arrow.